Think about a time in your life when you were wanting to make a change in your life. Was it in regards to being more active? Was it going back to school to advance your career/education? Was it to stop an addictive behavior? Whatever you were wanting to change in your life, without maybe really recognizing it, you were in one of 6 stages of change. The Six Stages of Change were identified by James O. Prochaska. The six stages include Pre-Contemplation, Contemplation, Preparation, Action, Maintenance, and Termination. With the changes come attitude, behavior, and an approximate timeline. Please note that these changes can vary in time length for each individual. Not all individuals are the same. Stage 1: Pre-Contemplation (What problem? Don’t bug me!) In this stage the individual is unaware of the problems that are associated with the given behavior. The positives of the behavior outweigh the negative behaviors, therefore, there is “nothing wrong.” There is not an intention to change and the individual is unwilling to change. Stage 2: Contemplation (I want to change…but then I don’t…) Individuals here are aware of their behaviors and are uncertain regarding positives and negatives. They are able to explore the pros and cons of change and wants to change, but also are unsure of the commitment and confidence in making the change. This change can take up to 6 months at a time. Stage 3: Preparation (I know I have to, but how?!) The individual is able to accept responsibility for the changed behavior; they are able to evaluate and select techniques that might be helpful for the behavior and they are able to make a plan. Their confidence and commitment increases. The change can take up to one month. Stage 4: Action (Now I can do this!!) At this stage of change, the individual is working towards the changed behavior. They are able to gain insight and develop new skills and consciously chose a new behavior. They learn more about their unwanted behavior. This stage lasts for less than 6 months. Stage 5: Maintenance (Stick with this!!) This stage is difficult and rewarding since the individual is able to sustain the new behavior without much thought or insight. They are able to find new patterns and have self-control. They are able to recognize the difference and focus on relapse prevention. This stage lasts for about 6 months. Stage 6: Termination The final stage is when the individual is able to adapt towards a new-self image which is consistent with the desired behavior and lifestyle. It does not react to temptation in any situation and can appreciate a healthier and happier lifestyle. An individual can go back and forth in the stages at any point of their lives. They may also start at any point in the chain. There is also always a chance of relapse and decision making which can always be altered. Now think back to when you were wanting to make a change in your life-what stage of change did you start in and what stage of change did you get to? How long did it take you to reach a point of contentment? 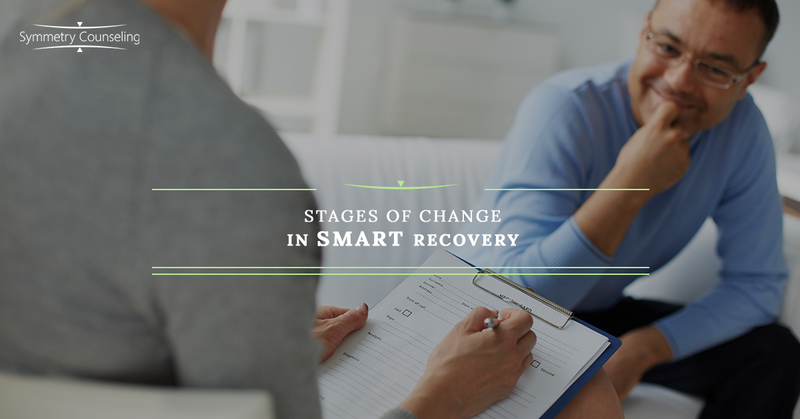 Stay tuned for more information and in-depth discussion about addiction and SMART Recovery. If you have any ideas or want further understanding, feel free to contact Meenal Patel, MA, LPC (mpatel@symmetrycounseling.com). For more information or if interested in joining Symmetry Counseling’s SMART Recovery Group, feel free to reach out to our trained therapist, Meenal Patel, MA, LPC.